Dendranthemum 'Pumpkin Igloo' flower color really pops with other early-fall flowers and foliage. 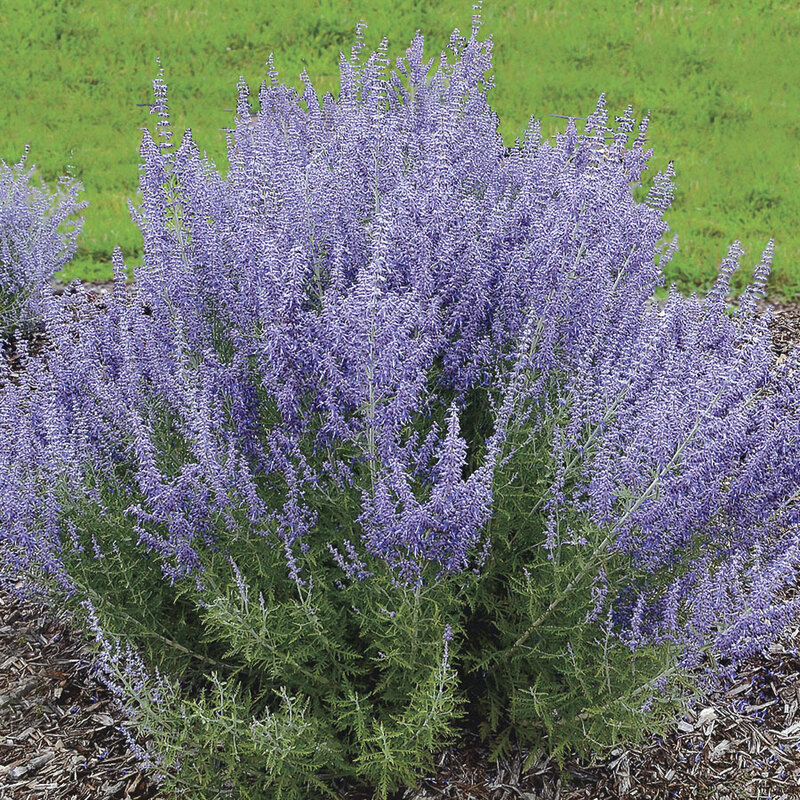 'Perovskia atriplicifolia (Russian Sage) is drought-tolerant and deer-resistant but can be a little too wild for some gardens. 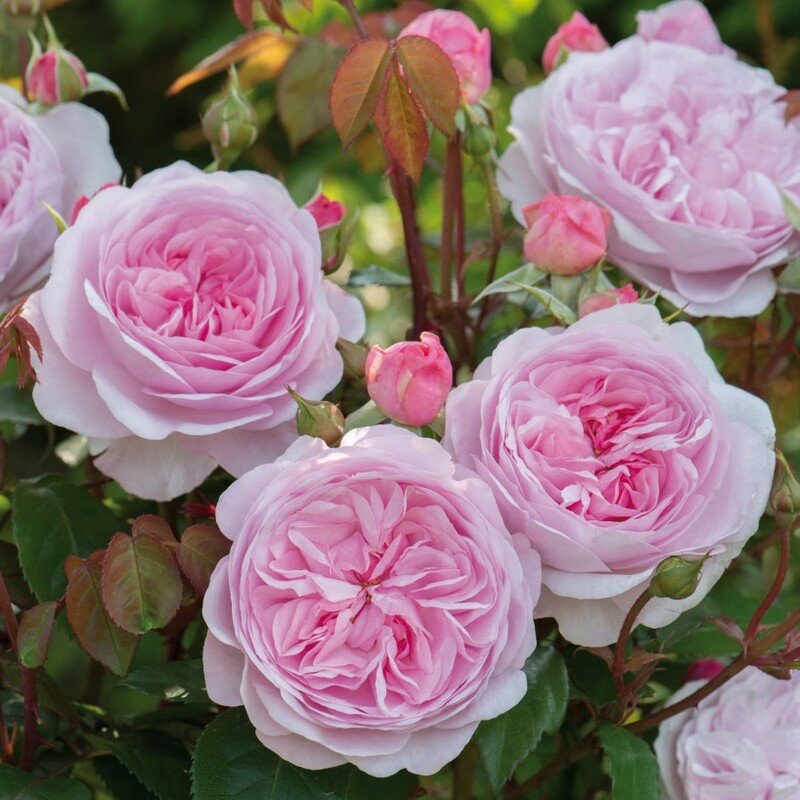 ‘Denim ‘n Lace’ is a new cultivar with shorter upright stems that won’t flop over. 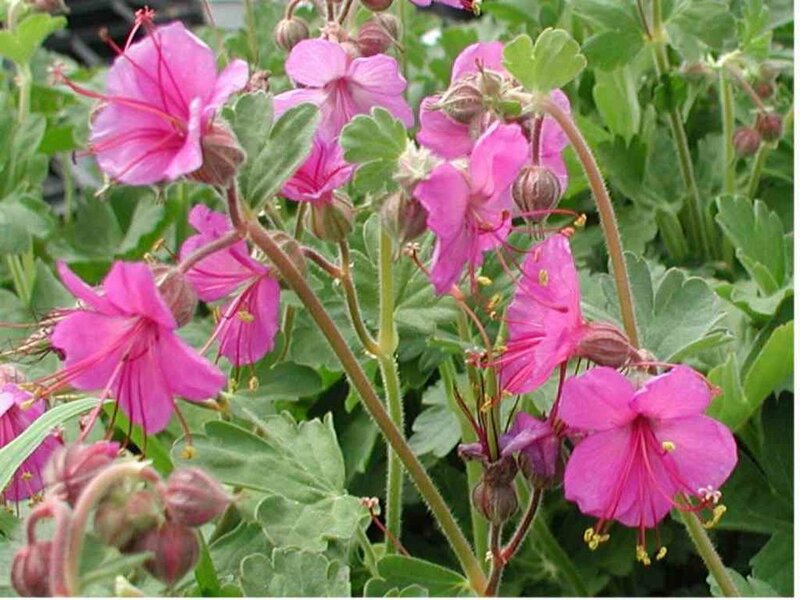 The Perennial Plant Association membership has voted and the 2015 Perennial Plant of the Year™ is Geranium X cantabrigiense ‘Biokovo’. 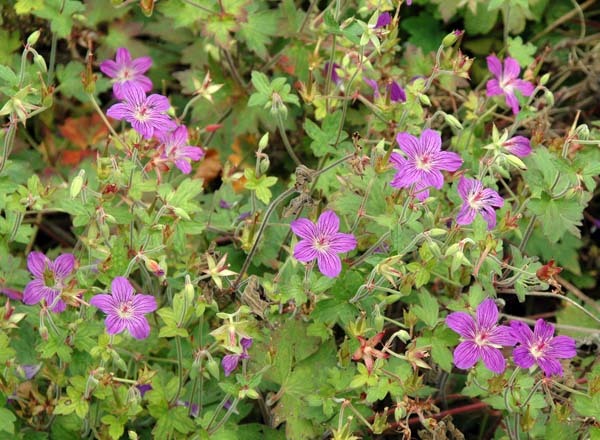 ’Biokovo’ is a naturally occurring hybrid of Geranium dalmaticum and Geranium macrorrhizum found in the Dalmatia region of present-day Croatia. It blooms in late spring with masses of 5-petaled white flowers, about ¾” diameter, that are tinged pink at the base of each petal and have darker pink center stamens. An interesting feature is that the sepals that are redder than the petals, so that when the flower opens the lightly tinged pink flowers provide a nice contrast to the sepals and stamens. It blooms from mid-May to late July. G. X cantabrigiense has aromatic foliage and rounded leaf edges and is semi-evergreen in most climates. It has a spreading habit and is rhizomatous, i.e. it spreads by sending out runners. It grows to 6-10 inches high, with a spread of about 2 feet. It can be used as a ground cover that spreads fairly rapidly through the perennial bed or as an edger in the front of the border. It also does well in rock gardens. It tolerates full sun to part-shade conditions. Its foliage turns scarlet and orange in the fall. Another G. X cantabrigiense variety is 'Karmina', because sometimes it matters what color the flowers are! 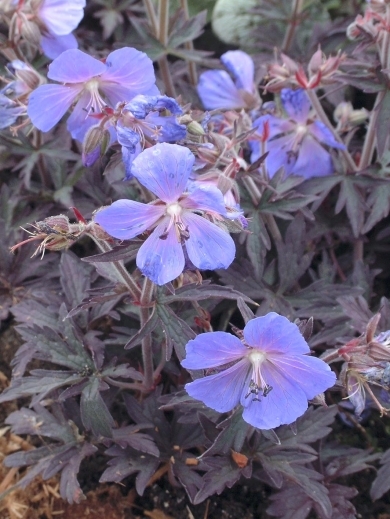 Geranium X cantabrigiense 'Karmina', seen below, has carmine-red flowers. Excellent mounding habit as they first start in spring, and some varieties maintain that habit. Deeply cut foliage; flowers with interesting veining patterns. They can be deadheaded after blooming, or the tops of the plants can be sheared back to new growth to stimulate re-bloom and freshen foliage. Many varieties have beautiful red, burgundy or orange fall color that is a stand-out if the plant has been allowed to weave intself throught the garden bed. Geranium pratense (Meadow Cranesbill), Z 5-7, 24-36" tall, purple flowers from reddish veins on dark blue petals, native to northern Europe, may need staking. 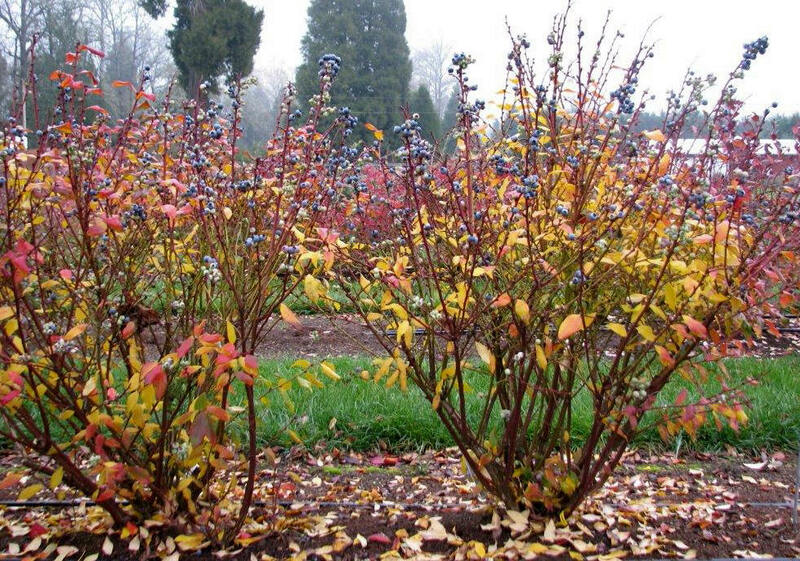 Some cultivars have dark foliage; need sun for optimal foliage color. Clump-former; blooms May – July. 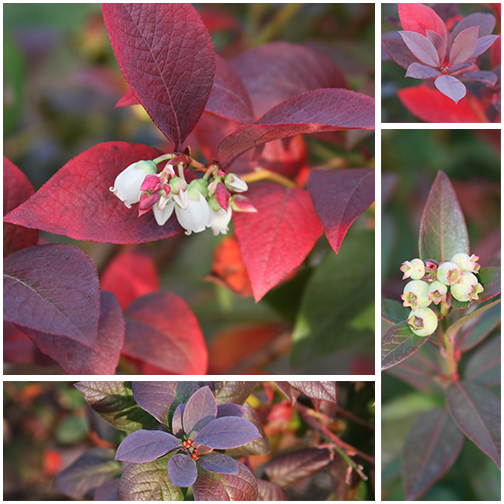 Cultivars include 'Dark Reiter', 'Midnight Reiter', 'Summer Skies', 'Purple Haze', 'Mrs. Kendall Clark', 'Splish Splash'. G. praetense does spread by seed, so it can pop up here and there throughout the garden - that may be a desirable trait if you're trying to get it to fill in, or an undesirable trait if you only want it in a certain place. Geranium sanguineum (Bloody Cranesbill) Z 3-8, 9-12", magenta flowers in spring, native to Europe and Asia, tolerates heat and drought; deeply divided leaves, bright red fall color, blooms in spring. Varieties include 'Striatum', 'Max Frei', 'Ankum's Pride'. Geranium wlassovianum Z 5-8, 18-24" tall; One of the first hardy Geraniums to bloom and one of the last to stop. Dusky violet flowers with deeper veining and a white eye. Fall brings outstanding deep red tones. Trails gently. Will adapt to most soil conditions provided there is good drainage and some moisture. Nice massed as a groundcover, in rock gardens or as an informal edger. Completely carefree. And, of course, Geranium X 'Rozeanne' seen below. 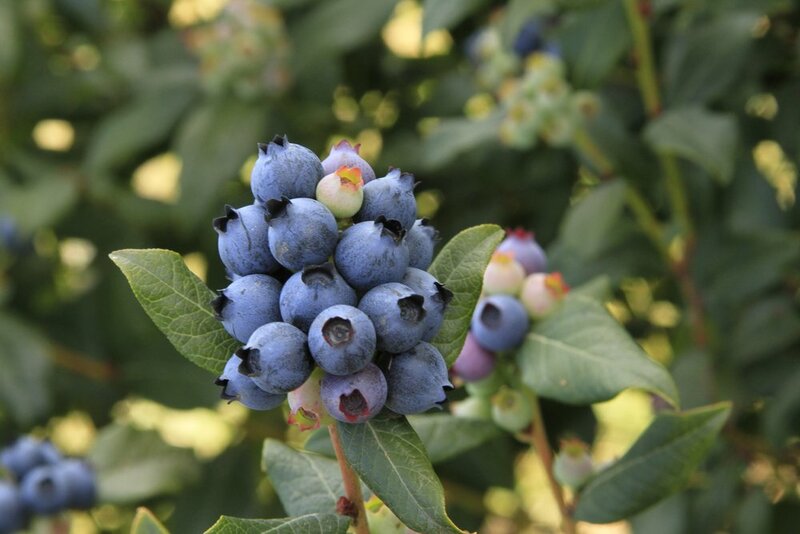 Unbelievable quantities of large, violet-blue blooms from June until frost; hardy to Z5; 20" tall with a 2 foot spread; bluish-purple flowers are heightened by black anthers, magenta veins and a radiant white eye. Fiery red leaves in autumn; withstands sunny, hot sites and is happy just about anywhere, from an exposed border to a container. 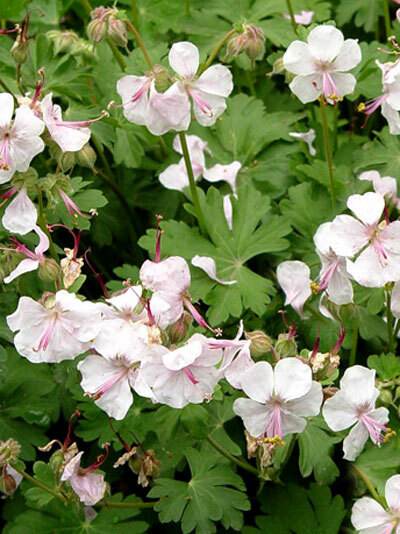 'Rozeanne' is a naturally occurring sterile hybrid of Geranium himalayense and Geranium wallichianum ‘Buxton’s Variety’. 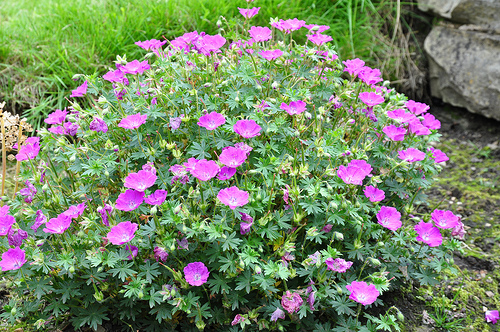 Lynden Miller says "No garden should be without Geranium 'Rozeanne'." Mike Ruggerio, one of my favorite teachers from NYBG, basically knows everything about anything related to trees, shrubs, perennials, annuals and bulbs. His talks are always both funny and fascinating – you never fail to learn about a million new things. And you long to see what his own gardens are like! This particular talk was on new perennials – new cultivars that fit his definition of a perennial – “a plant that comes back after more than two years” - meaning they are cold-hardy, adaptable, easy, beautiful and for the most part long-blooming – many also deer resistant. I’ve chosen a few that I love too, or that I’m definitely going to try. Achillea ‘Oertel’s Rose’ (yarrow) is a lavender-pink, gentle form of yarrow – a nice alternative to golden yellow that fits in well with the purple/white/pink/chartreuse/burgundy garden. I love the fresh foliage of yarrow in the spring – it’s one of the earliest. BUT it’s a dry meadow plant – it won’t be nice if you don’t have the right conditions. Actaea ‘Hillside Black Beauty’ and ‘Black Negligee’ (bugbane) are dark-foliaged cultivars of the green-leaved species. Bugbane is wonderful in shade, with mounds of almost-black foliage and fragrant white wand-like flowers rising up several feet above the foliage in autumn. It’s an excellent back-of-the-border choice for your shade garden. The newest cultivar ‘Black Negligee’ has foliage that is more purple than black – we’ll see if we can get better photos this season that show it’s purple-ness. ‘Black Negligee’ typically grows to 4-5’ tall and is a noteworthy addition to the garden for its deeply-cut, dark purplish-black leaves on branched, dark stems. 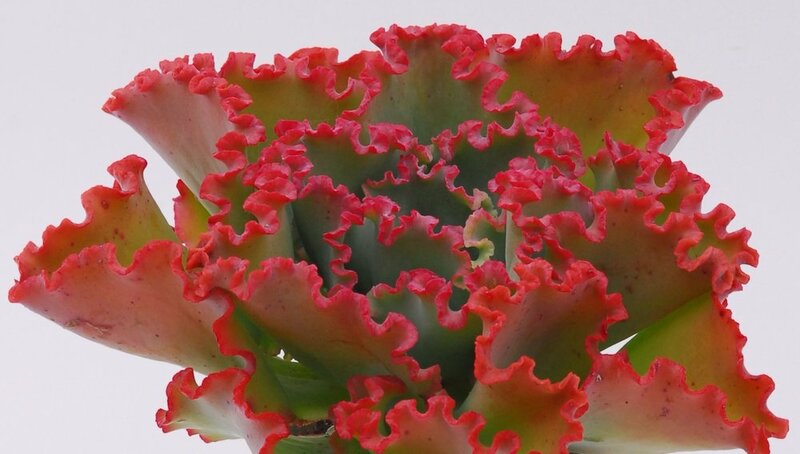 The foliage has a lacy effect, hence the cultivar name, and makes an effective accent throughout the growing season. Corydalis lutea (yellow corydalis) seems to have it all if you’re in the market for a self-seeding spreading deer-resistant ground cover for shade that flowers from May till frost. 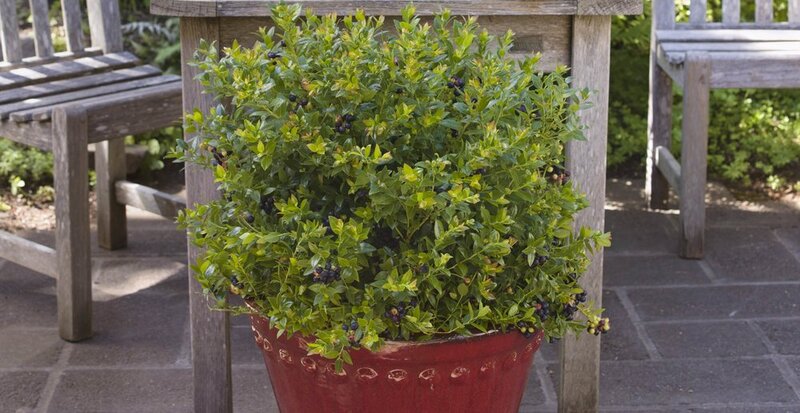 It’s easily grown in average, medium, well-drained soil in part shade to full shade. Corydalis doesn’t tolerate wet feet, and wet soils in winter can be fatal. 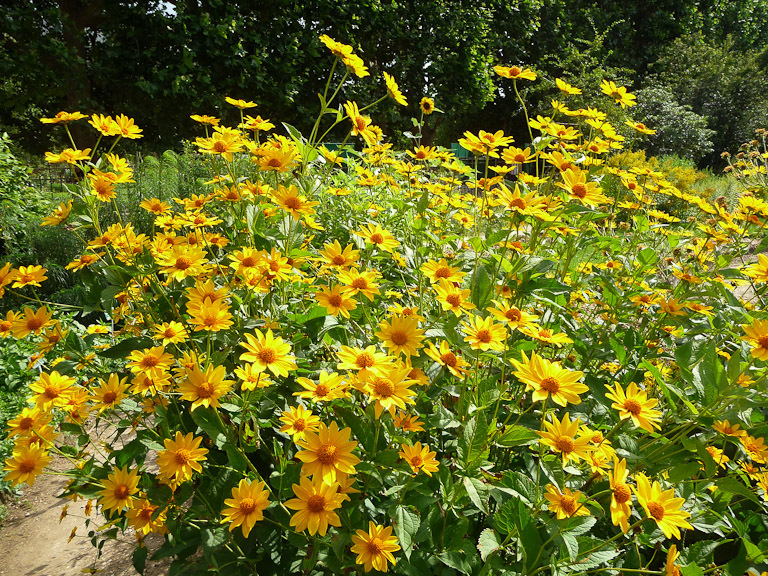 It forms a mound of ferny, medium green foliage to 15" tall and 18" wide and produces bright yellow flowers. It’s great for shaded rock gardens or border fronts and forms a nice ground cover in shady woodland areas. Wear gloves – the sap is very irritating. Echinacea purpurea ‘Fragrant Angel’ (coneflower) has taken over as “best white coneflower”. It’s a pure white color that stays white and it’s also quite fragrant. Don’t plant it if you have groundhogs – they’ll come from far and wide and eat every bite on the first day. Hemerocallis X ‘Barbara Mitchell’ is his favorite daylily – a “true pink” flower 6” wide. He also enthused about H. X ‘Bill Norris’, a golden daylily that grows 4 ft tall. 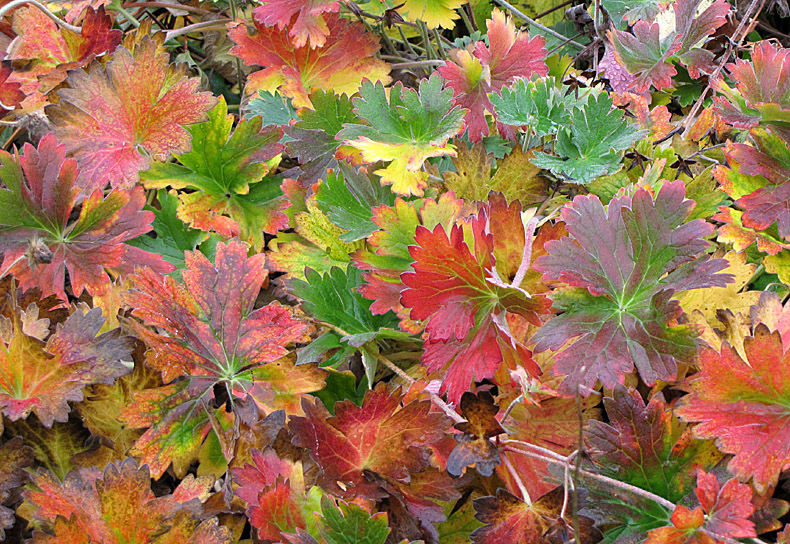 For those of you who don’t already know about Geranium macrorrhizum (bigroot geranium), here’s another shade plant/groundcover that is deer-resistant, has either white or pink flowers, spreads enthusiastically by runners, has a nice fall foliage color and is semi-evergreen in our area. It flowers in May – June, and after that is just a mound of foliage. 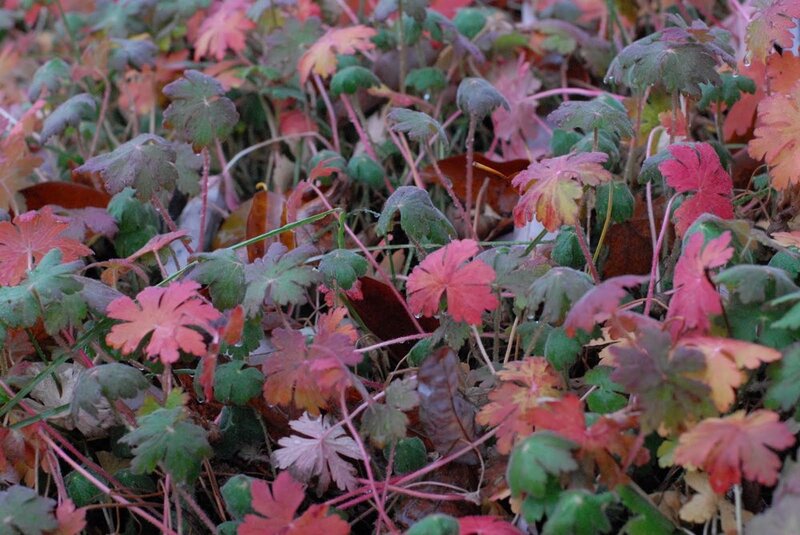 Another geranium that he mentioned in passing is one of my new favorites – Geranium X ‘Midnight Reiter’ (cranesbill) – it has purplish-black leaves and dusky blue-violet flowers. It goes with everything, and, like most cranesbill, spreads nicely. His favorite new aster cultivar, Aster tataricus ‘Jin-Dai’ (tatarian aster), a full-sun standout that blooms in October when basically nothing else is flowering. ‘Jin-Dai’ is a compact cultivar (believe it or not! ), typically growing 3-4' tall. (The species may reach 6-7' tall). Distinctive almost tobacco-like basal leaves are up to 18" long and 5" wide – interesting foliage for the spring garden. Dense and abundant blue flowers with yellow centers appear in autumn on rigid stems. This late bloomer doesn’t need pinching to control height and doesn’t flop (i.e. 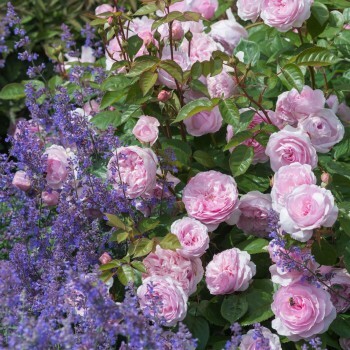 doesn’t need staking) as long as it’s in full sun and usually blooms until the first frost. Added bonus - attractive to butterflies!